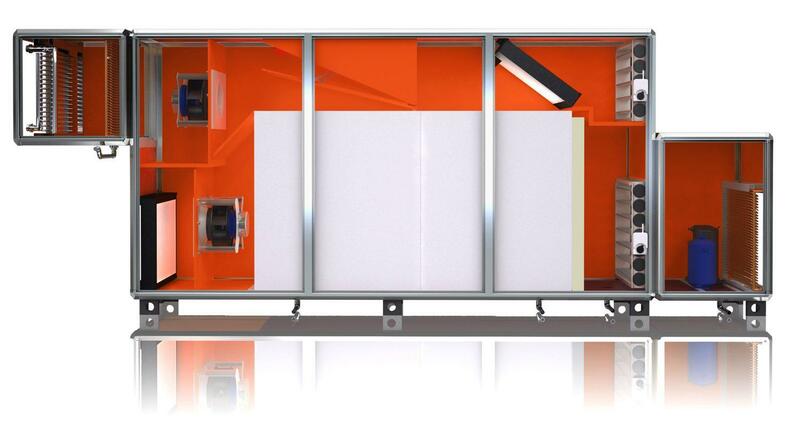 Units in the Trisolair 52 and 59 series combine the highest heat recovery efficiency, low pressure drops and compact design. The units already meet the requirements of the second step of ErP 2009/125/EC. Ideal application areas are refurbishments at low to medium air volumes. A compressor refrigeration system integrated into the 59 series increases the cooling capacity of the overall system at high temperatures and additionally allows dehumidification of the outside air. In case of low outside temperatures the system operates completely in heat recovery mode. The cross-counterflowcross plate heat exchanger enables the recovery of up to 80% of the heat contained in the return air. The standard integrated heating coil compensates for ventilation and transmission heat losses of the building as required. If the outside air temperatures rise, the heat recovery requirement is reduced. The bypass dampers, which run along the entire depth of the device, are continuously regulated in order to achieve the desired supply air temperature. If the outside temperatures continue to rise, the heat recovery is completely bypassed. The design of the bypass reduces the internal pressure drop on the OA-SA path and hence also significantly reduces the power consumption of the fan motor as it is effective over the entire depth of the unit. Cooling operation type 59: Where outside air temperatures are sufficiently high, the heat exchanger is used for precooling the outside air (cold recovery). This minimises the electrical capacity required by the integrated compressor refrigeration system, which cools the supply air to the desired temperature and dehumidifies it if required. If unfavourable temperature conditions mean that precooling is not practical, the heat exchanger is bypassed.